A house under construction in Fernley as seen on Thursday, Nov. 16, 2017. Photo by David Calvert/The Nevada Independent. When Cal Eilrich hits Vista Boulevard while driving east on Interstate 80, he breathes a sigh of relief. It’s the last interchange on the outer rim of the Reno-Sparks metropolitan area. “I actually wind down a bit,” he said. 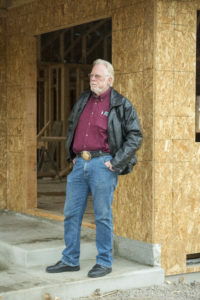 Cal Eilrich, a longtime homebuilder in Fernley, stands outside a home that’s under construction in the small Northern Nevada city. Fernley is growing again because of the housing crunch affecting the Reno market. Photo by David Calvert/The Nevada Independent. The juncture means Eilrich is that much closer to Fernley, his home since 1993 that lies 30 miles east of Reno. The incorporated city boasts 19,000-some residents and a literal Main Street dotted with a Family Dollar, several salons, a tattoo parlor, used car lot and a longtime restaurant and casino, among other small businesses. Once Nevada’s fastest-growing city, the former ranching community more than doubled its population during a building boom that started in the late 1990s and lasted until the economy tanked during the Great Recession. Fernley then earned a not-so-coveted reputation — the place with the nation’s highest foreclosure rate at one point. “We were left with a lot of abandoned subdivisions and foreclosed homes,” City Manager Daphne Hooper said. But it’s no longer a dormant community. A housing crunch in Northern Nevada has forced some residents to seek more affordable options outside the traditional Reno market. As economic activity picked up in Reno, fueled by big-name companies such as Tesla, Switch and Amazon moving to the region, home prices soared in the self-proclaimed Biggest Little City. It’s a function of supply and demand: Northern Nevada’s housing inventory hasn’t kept pace with the number of people moving there for jobs, thus driving up costs in the process. Enter Fernley. The quiet city boasts a median home price that, while up 27 percent from a year ago, still remains more than $100,000 less than what it is farther west. The Reno-Sparks Association of Realtors reported in October a median home price of $348,500 for the greater Reno area, which includes Sparks, compared with a $241,500 median price in Fernley. Plus, Fernley sits 18 miles from the mammoth Reno-Tahoe Industrial Center, which counts Tesla, Walmart, Google, Zulily and Switch among its anchor tenants. “People were moving here before all the jobs for quality of life,” said Eilrich, a former city councilman and incoming president of the Fernley Builders Association. Now, they’re coming for the relative bargain as well. Seven subdivisions are building homes again, many on lots that were developed before the economic crash, he said. 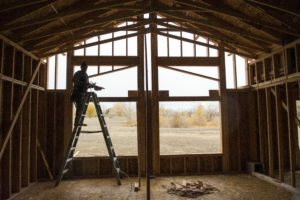 The hum of home construction in Fernley is a sound some Northern Nevada leaders say should be more prevalent across the region. They warn that inaction could make a bad problem worse, endangering the economic renaissance the city is experiencing. Others disagree. They argue building too many homes too soon could place the region in jeopardy of another housing bubble. If you ask the man who leads the Economic Development Authority of Western Nevada about the housing situation, he’ll appear visibly frustrated. He considers this a belated conversation. “The first thing we must do is understand that THIS IS NOT A BUBBLE!” he wrote, noting that 20,000 jobs had been added but only 4,000 new housing units. Kazmierski rejects the notion of an emerging bubble, pointing to the strong job growth and low unemployment rate. The Reno area’s unemployment rate fell to 4 percent in September, according to the Nevada Department of Employment, Training and Rehabilitation. Those who, like Kazmierski, downplay suggestions of a bubble say they don’t see risky lending practices, investors buying scores of homes or signs of a slowdown in job growth, all of which contributed to the last housing bust. Northern Nevada’s housing needs, they say, are real and growing more urgent by the day. By Kazmierki’s estimate, the Reno area needs to add 6,000 new housing units — which could be a combination of single-family houses, townhomes and apartments — to the market each year to keep up with the growth. His number is slightly more conservative than the one proffered by Nevada’s chief economic development officer, Steve Hill, who said there are about 1.35 jobs per household. Because the region has been adding about 10,000 jobs per year, it needs roughly 7,000 new housing units to meet demand, he said. Washoe County issued 2,776 new housing permits in 2015 and 3,595 in 2016, according to data compiled by EDAWN. This year, the county is on track to issue 4,500 residential permits. But even if homebuilders ramp up construction, will buyers be able to afford the homes? A sold sign marks a home that’s under construction in Fernley on Thursday, Nov. 16, 2017. Photo by David Calvert/The Nevada Independent. Housing affordability remains a chief concern for economists and real-estate officials studying the Reno market. Browse websites such as Zillow or Trulia, which feature homes for sale, and you’ll be hard-pressed to find many Reno-area listings under $300,000. Those that do fall in the $200,000 range or lower are usually older and smaller, two-bedroom houses or condominiums. The median sale price for homes in the Reno-Sparks metro area shot up to $357,500 in July. That same month, the median sale price for homes within the city limits of Reno only hit $385,000 — its highest level since the pre-recession building boom. By comparison, the metro area’s median home price had plummeted to $180,000 in October 2012. Median sale prices dipped in August and September this year, which officials attributed to the market’s “seasonal cooling,” before increasing again in October. The problem: Inflation-adjusted wages largely have been stagnant and certainly not increasing as much or as fast as housing prices. Nevada’s median household income in 2016 was $55,180, which is slightly below the national average of $57,617, according to the U.S. Census Bureau. That phenomenon is why Eric Novak, president of the Praxis Consulting Group in Reno, said it’s possible for the city to be experiencing a housing bubble simultaneously with a housing crisis. As affordability becomes an increasing issue, Novak said he already knows some people who have moved away from the area. And, on the rental side of the market, he said much of the construction activity is for higher-end, multi-family dwellings as opposed to housing units for displaced, low-income residents. Developers aren’t necessarily rushing to construct new homes either. 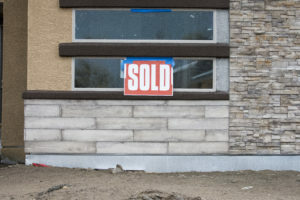 “Right now, you still need to a take a conservative approach in my opinion,” said Perry Di Loreto, owner of Di Loreto Homes, who witnessed the recession hammer the construction industry. He considers the Reno housing situation a normal cycle, driven by the area’s growth spurt and increased awareness about its quality of life — a mid-sized city with Lake Tahoe and other outdoor gems only a short drive away. The prominent developer, however, said he won’t engage in any speculative homebuilding practices. He wants to build houses that families live in and call home. The cautious mindset doesn’t surprise Hill, who owned a concrete company prior to joining the Governor’s Office of Economic Development. Time will tell how high housing prices continue to climb. As for overcoming some of the related problems, that will take time, too. While awareness has grown, reaction to the problem hasn’t happened as rapidly as Kazmierski would have liked. He blames the sluggish response on a combinations of factors, including residents’ reluctance to add higher-density housing and government entities’ inability to fast-track projects through the permitting process. John Graham, president of the Reno-Sparks Association of Realtors, said the community needs to keep thinking creatively and continue efforts to refurbish old buildings into housing, find infill opportunities where new residences can be constructed within the urban core and incorporate affordable housing in each development project. A homebuilder works on a house in Fernley on Thursday, Nov. 16, 2017. 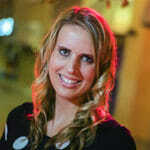 Photo by David Calvert. It’s a sentiment shared by Reno Mayor Hillary Schieve, who said she wants to treat developers like partners as the region grapples with this problem. There are practical solutions, such as changing zoning to allow higher-density residences or finding suitable land parcels for development, that the city could pursue, she said. On Friday, a bit of good news arrived in Schieve’s email inbox: Construction activity had bumped up the rental vacancy rate to above 2 percent, which could curb rent increases if the trend continues. The city recently added 112 rental units and has another 3,000 units in the construction pipeline. Ultimately, Kazmierski hopes the region avoids a “drive until you can afford” mentality as much as possible. Fernley and other farther-flung locales like it, he said, should be an option but not a necessity. Still, Cal Eilrich’s peaceful habitat — a place that lacks big-city amenities but boasts basic shopping and a small-town feel — will likely buzz with construction noise for the foreseeable future. And, as a homebuilder and a resident, he’s OK with that. Three years ago, no new homes were built in Fernley, the city manager, Daphne Hooper, said. Last year, the city added 160 single-family homes to its ranks, a number she expects repeated in 2017. The growth could mean it will take Fernley residents a tad bit longer to navigate the city’s roundabout toward the Walmart and grocery store. As far as Eilrich is concerned, that’s a minor inconvenience compared to the congestion Reno roadways may see if growth projections pan out.